Take your pick between a BBQ lunch at Martha’s Corner, a High School musical, a community garage sale, a comedy show, poetry readings, or go to all five! Lunch Time with Backwoods Barbecue at 11 a.m. at Martha’s Corner, 100 East Dewey. Stop by and see us on your lunch break. We will have a full menu! For more information, visit the Facebook page here. Family Fun Night at Sapulpa Middle School from 5 to 7 p.m. at 1304 East Cleveland. Entry is free! $5 wristbands for unlimited inflatables. There will be face painting, henna, Indian tacos ($6), concessions ($5), Pie a Teacher, games, inflatables, and more! Sapulpa Artists’ Guild Paint Classes from 5:30 to 7:45 p.m. at the Sapulpa Senior Citizen Center, 515 East Dewey Avenue. The class is free and help is available from art teacher Sam Houghton. The group works in oil, acrylic, and watercolor as well as pastels. There is an optional $20 per year membership donation. You may also visit the class before joining. Parking is available in the back parking lot, behind the building. Use the back door to the building. For more information, visit the Facebook page here, or call Sam at 918-224-8106. Cobblestone Glaze Technique Class from 6:30 to 8:30 p.m. at The Painting Gypsy Studio, 619 North Mission in Sapulpa. $15 per person. A textured glaze class. For more information, please visit the Facebook page here. Business Professionals Bowling League on Thursdays nights at 6:30 p.m. There will be 4-member teams, any combination of men and women. The cost is $12 per person, per week. Awards will be provided! For more information call 918-224-BOWL or visit the Facebook page here. “Thoroughly Modern Millie” Musical presented by the Music and Drama Departments of Sapulpa High School, 7:30 p.m. at the W. H. Shaw Auditorium. Tickets are $5 apiece. Musical director and producer – Gina Meyers. Stage director – Becky Braswell. Band director – Craig Amendt. Also showing Friday and Saturday at 7:30 p.m. For more information, please visit the Facebook page here. Personal tax assistance by the AARP at the Sapulpa Public Library on the lower level on Wednesdays and Fridays from 10 a.m. to 4 p.m. This program begins Friday, February 1 and ends, Friday, April 12. This is a FREE tax service, for all ages and incomes. (The Library lends the space for tax services and does not make appointments, take calls, or know details of tax prep, etc for this program. The Library is not affiliated with the AARP.) For more information and for the schedule click here. Sapulpa High School Soccer versus Shawnee at the Sapulpa Soccer Fields. J.V. Girls play at 3:30 p.m., J.V. Boys play at 4:30 p.m., Varsity Girls play at 6 p.m., and Varsity Boys play at 8 p.m. Ceramic Easter Plate Painting Class from 6:30 to 8:30 p.m. at The Painting Gypsy Studio, 619 North Mission in Sapulpa. The cost is $20 per person and a stencil is included. For more information, please visit the Facebook page here. “Thoroughly Modern Millie” Musical presented by the Music and Drama Departments of Sapulpa High School, 7:30 p.m. at the W. H. Shaw Auditorium. Tickets are $5 apiece. Musical director and producer – Gina Meyers. Stage director – Becky Braswell. Band director – Craig Amendt. Also showing Saturday at 7:30 p.m. For more information, please visit the Facebook page here. Sapulpa FFA Booster Club Golf Tournament from 8 a.m. to 6 p.m. at the Sapulpa Municipal Golf Course, 1200 West Dewey. Mark you calendars for a great golf tournament! The cost is $75 per person or $250 foursome ($300 day of tournament). There will be great awards and prizes! Golf cart & lunch included. For more information, visit the Facebook page here. FCC Sapulpa Garage Sale from 8 a.m. to 3:30 p.m. at the First Christian Church Sapulpa, 220 East Lee Avenue. We guarantee that there will be something to find for everyone! All proceeds go towards the students’ trip to CIY MOVE. For more information, please visit the Facebook page here. 29th Annual EGGstravaganza hosted by the City of Sapulpa Parks and Recreation at 9 a.m. at Kelly Lane Park, 1151 South Park. Bunny Hop Hunt age groups are as follows: 1-2 years, 3-5 years, 6-9 years, and 10-14 years. There will be plenty of goodies for everyone! In the case of inclement weather, the rain out date will be the following Saturday, April 20. 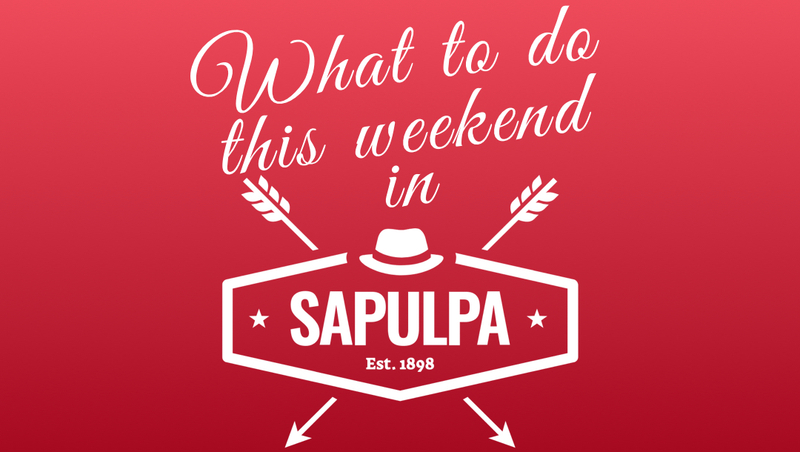 For more information, please stop by the Parks and Recreation office at 515 East Dewey, call 918-227-5151, or email parkrec@cityofsapulpa.net. Tai Chi: Moving for Better Balance (LAST WEEK!) at 10:30 a.m. at Good Shepherd Episcopal Church, 1420 East Dewey Avenue in Sapulpa. This is a FREE 12-week program conducted by Gina Wozencraft and put on by the Creek County Health Department. Through simple, graceful movements that are easy to learn, Tai Chi builds physical stamina, improves one’s balance, muscular strength, postural control, self-confidence, memory, and reduces the likelihood of falling. Join them for this great program! Kids’ Bunny Canvas Painting Class from 5 to 6 p.m. at The Painting Gypsy Studio, 619 North Mission in Sapulpa. For $15 per child, you will get one 8×10 outlined canvas and step-by-step instruction on how to paint it. Parents are welcome to paint too! For more information, please visit the Facebook page here. The Veterans of Comedy from 6 to 8 p.m. at the Sapulpa VFW, 1201 West Dewey. Get your tickets in advance for the Comedy show. $10 in advance, $15 at the door, $2 off with Military I.D. This show is for adult audiences 21 and over. There will also be food available! For more information, please visit the Facebook page here. “Thoroughly Modern Millie” Musical presented by the Music and Drama Departments of Sapulpa High School, 7:30 p.m. at the W. H. Shaw Auditorium. Tickets are $5 apiece. Musical director and producer – Gina Meyers. Stage director – Becky Braswell. Band director – Craig Amendt. For more information, please visit the Facebook page here. Fifty-Five and Alive Workout at 9:30 a.m. on Tuesdays and Thursdays at the Faith Fitness Center at Faith Church, 1901 West 171st Street South in Glenpool. The Faith Fitness Center at Faith Church has opened and it’s free to everyone! If you’re 55+ join them for this new class. It involves stretching and exercises to maintain a healthier body and is taught by Kim Clevenger. Zumba with Kim & Becky from 5:30 to 6:30 p.m. on Tuesdays and Thursdays in Kellyville. The cost is $5 a class, and cards are available. Call Becky at 918-231-4042 or Kim at 918-852-4378 for more information. Oklahoma Kids Kiefer Local Competition at 9 a.m. on Saturday at the Kiefer Event Center on South 49th West Avenue. Qualifying acts will go on to compete at the State Competition in June. There will also be prizes, awards, and trophies presented to winning acts! For more information, visit the website here, the Facebook page here, or contact Nathan Johnson at 580-320-3102 or NLJOHNSON2@yahoo.com. Woodlake Glenpool Easter Egg Hunt from 10 a.m. to 12 p.m. on Saturday at the Glenpool Conference Center, 12205 South Yukon Avenue. Kids 5th Grade and under will have a blast hunting eggs during multiple hunts, jumping on giant inflatables, playing wacky games, enjoying free food, and more! For more information, please visit the Facebook page here. River Country DU Crawfish Boil Hosted by Oklahoma Ducks Unlimited and River Country Ducks Unlimited from 6 to 9 p.m. on Saturday at the Creek County Fairgrounds, 17806 West Highway 66 in Kellyville. There will be great food, cold drinks and lots of raffles for over 20 items that you can’t mention on Facebook. For more information, please visit the Facebook page here. ASCS Sooner Region Winged Sprint Car Series at the Creek County Speedway from 8 to 11 p.m. on Saturday at 18450 West Highway 66 in Kellyville. You don’t want to miss these 700-horsepower, methanol-burning, winged monsters race around the bullring at Creek County Speedway. This will be round 3 of 20 for the American Bank of Oklahoma ASCS Sooner Region presented by Smiley’s Racing Products. Over $15,000 is on the line with the 2019 Champion pocketing $3,000 of it. If a driver finishes in the top 10 with 75% or better attendance that driver will make no less than $1,000! For more information, please visit the Facebook page here. Second Sunday Poetry at 2 p.m. on Sunday, April 14 at the Tidewater Winery 54560 West Highway 16 in Drumright. Join them on the second sunday of each month for poetry. Each month they will feature a different poet. This event is open to the public. For more information please visit the Facebook page here. ← Nerd Knowledge: What is science, really?